As a chef and general food nerd, I honestly think that China Central Television’s A Bite of China is the greatest food show of all time. To newbies, I describe it as a gorgeous blend of Planet Earth’s aesthetics (watching in HD is a must), Chef’s Table’s sense of reverence, and the Edible magazine series’ focus on specialty food artisans. Have you ever wondered where lotus root comes from or thought about how to cook sea cucumbers? Though the show hasn’t been localized in the West, versions with both English subtitles and dubbed speech are available on YouTube. As you can probably tell, the show really explores all the nooks and crannies of China’s culinary arts, and since it’s a show made by and for Chinese nationals, it explores the deep cuts of the country’s regional specialties in a way that is unmatched by any outside coverage of Chinese food. The show’s two seasons encompass 14 episodes, with each one focusing on a loose theme, like foraging or different fermentation techniques. As in Planet Earth, an unseen narrator guides the experience, though the script in this case also includes a great number of bromides about the unique values and exceptional palates of the Chinese people. Accordingly, the show is at its strongest when it lets the foragers, hawkers and farmers take the spotlight. Most, if not all, of the featured food workers are shown cooking at least one meal at home or in the field, and their dishes, which highlight their products in humble, sustaining contexts, are fascinating. While watching, I found myself studying their trained movements, watching for gestures and small techniques that I could use in my own cooking. In that way, A Bite of China has not only taught me about the breadth of Chinese cuisines; it’s also shown me countless ways to subtly improve my own relationship to the food that I make. Here are a few of the ideas I took away from the show. 1. There is more to lotus root than stew. One really interesting way to eat lotus root is to slice it into rounds, then sandwich seasoned ground meat in-between two pieces. The “sandwiches” are then battered and fried, turning them into deliciously crunchy and savory snacks. Here’s a nice-looking recipe for lotus root sandwiches. 2. Basting whole fish with oil is cool as hell. For a New Year’s celebration dinner, a fisherman’s son makes a dinner consisting of mainly fish dishes. One of them involves taking a whole, scaled fish, cutting slits in it angled toward the head, and basting it with hot oil while holding it by the tail. As the oil cooks the fish, gravity forces the flesh to angle outward, making for a really interesting presentation. 3. Mexico and China share a ton of culinary ideas. Though the prominence of chili peppers in Sichuan cuisine is an obvious tie to Mexico, the dish that really threw me was the Xi’an-style meat burger. Featuring gelatinous stewed meat stuffed in a sliced baked bun, its texture and basic composition are strikingly similar to another street food from around the way: the Mexican carnitas gordita, especially when stewed pork skin gets involved. Having had both, I can say they’re equally drool-worthy. 4. Making homemade tofu seems totally worth it. After seeing a small sample of tofu makers show off their craft, I’m inspired to make my own tofu. Like many foundational food processes, tofu-making seems pretty straightforward; though I’m sure I’ll screw it up in big ways. But I want to access the interesting and unique variations on tofu I saw in the show, from fermenting it in the sun to flavoring it with vegetables. 5. Chopping fermented napa cabbage is easy. You just pull the tough bottom of the leaf to separate it into two layers, then slice! How did I not think of this before? 6. 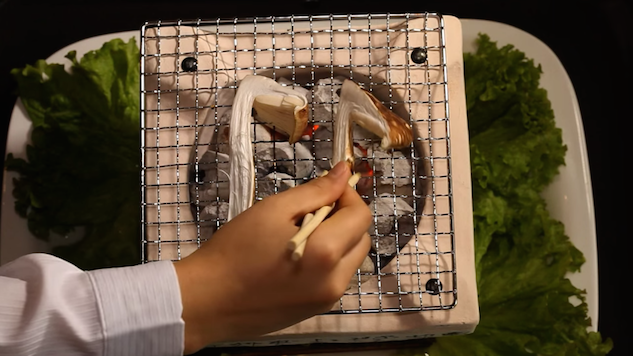 You can smoke food with sugarcane pulp. Sugarcane pulp lasts longer than straight up wood as a smoking medium. Plus, it sweetens the surface of your food and browns skin really nicely. I’m definitely going to be hitting up my local sugarcane juice vendors for this stuff. Watching a traditional sea salt maker process sea water by hand or with simple machines—because he believes the work is too delicate for big machinery—gave me a deeper appreciation for something that I’ve taken for granted my entire life. It now embarrasses me to think of all the salt that I’ve spilled as a cook, and I can finally understand why salt has had such a high value in our history, as both a trade item and as a spiritual tool. But more than anything, I remember the image of the salt maker’s toddler son splashing his feet in the salt flats and feel deeply humbled. 8. Dumpling making is serious business. Because it knows exactly how and where I get my kicks, the show gives its many dumpling folding shots the extreme close-up treatment. For instance, it excites me to know that a certain chef’s ideal number of soup dumpling folds is exactly 32, or that there are about as many ways to fold jiaozi as there are families in Beijing. Also, did you know pomelo pith-wrapped dumplings are a thing? Chinese grannies have been blowing my mind like mad.